Under the section titled “Dialogs now return optional” I think you have a code mistake. In the first example you code “String name = …” and then ask the question “if (response != null)”. I think the String variable should be called “response”. 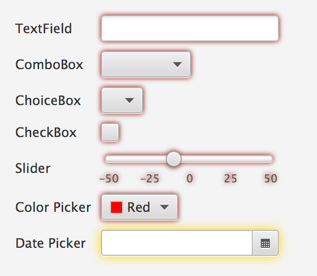 how to use spreadsheetView with SceneBuilder 2.0? wonderful updates i can make a pivot table based on spreadsheetview, thanks!great job! ok, i’ll commit my work once i complete it. It’ll be great honor to be adopted. Another great update! Bug report though: trying to create a notification when all windows (stages) are hidden (and platform.setImplicitExit is set to false ofc) will give an error about a null owner window. However, for many applications, this is an important feature to have – they should be able to run in the background (mines in notification pane) and still be able to show notifications as they come up. Any chance you could fix this? Thankyou for such a great release! controlsfx-samples-8.0.6.jar throws a NullPointer if you try out the “SpreadsheetView”. Apparently a logo is missing, even though all the pictures are in the JAR. PS: I can post the hole exception if you want. Please file issues here: http://issues.controlsfx.org – thanks! i use the Validation framework. Here my Code. I want when the Checkbok is true that the validation support is active . 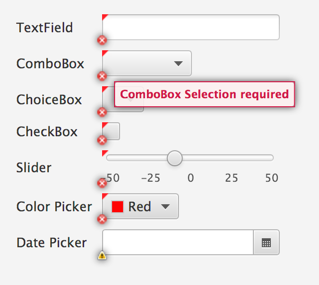 If the checkbox is false then no more. Is this possible . This is the right Code.